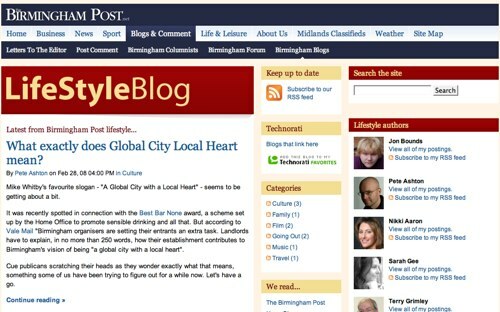 I was pleased to be asked, and am now one of the Birmingham Post‘s bloggers on its newly relaunched website. Despite the hallowed environs of the mainstream press it’s not a paid gig – so why am I doing it? And more to the point what am I doing in the Lifestyle section? Adding another blog to write for wasn’t really the aim, hell I could start another in a second on any topic I wanted. there was, however, something exciting about writing for a different audience. The Post as a local broadsheet is quite an odd beast, one that I’ve admired but never really engaged with because of how poor their web-outing was (a man can only read so many papers without a commute). I’m guessing that the new site will introduce a fair number of people to blogs, people who– rightly – aren’t excited by the “a kind of online diary” thing that sections of the media still use. So, Lifestyle? Well, I won’t be writing about alternative medicine, or shoes (except maybe the odd fantastic pair of pumps), I’m currently thinking that my aim here is to write more informed pieces about the stuff I normally go on about. Something halfway between here and BiNS, intelligent, modern, culture stuff with an interweb slant. I don’t intend to modify my style, or re-hash other stuff. The first post was a odd one, as it had to be written before the site was live, I’m not sure how reading the other blogs on the site will affect future stuff. It’s also exciting that the people working on the Post, and the site, have really taken the internet to be something different to the paper. Joanna Geary was terrified of blogging only a couple of months ago, but she’s recruited and started off a whole host of bloggers for the section. Oh, and they use Movable Type, something I’ve never had a go of before, which is nice.